To get your fresh start, you need the facts. So we made you this guide. When you’re looking for solutions to a bad financial situation, it’s instinct to stick to what you know and what you’ve heard – even when what you’ve heard might not be true. We’re here to swipe myths and misconceptions out of the way to give you the facts about bankruptcy: a serious debt relief option you might not have thought to really consider. Almost all property can be fully protected in a bankruptcy. Bankruptcy is an option for you even if you’re making good money and paying your bills on time. If you think you don’t know anyone who has experienced financial trouble like yours, it’s likely you simply don’t know about it. Most counties in Western Pennsylvania do not publish filings in the newspaper, and those who file are able to live perfectly normal lives. Most importantly, filing bankruptcy does not make you a failure–it’s a sign you’re willing to take a step to financial recovery, which is the first step into the future you envision for yourself. So let’s start with the facts! 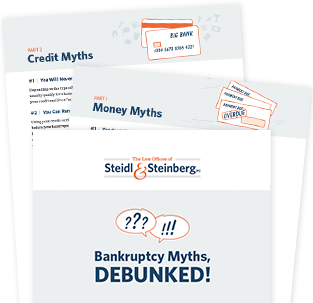 The name and email address you provide to download "Bankruptcy Myths, Debunked!" is for sign-up purposes only and will not be shared with outside parties. Steidl & Steinberg is dedicated to respecting your privacy. Please feel welcome to review our privacy statement.